Autel MaxiSys – Common rail Euro-III engine controls fuel pressure with one control valve which controls inlet or outlet of fuel line. Inlet control type has disadvantage of activating fast increase of fuel pressure when initial starting or sudden acceleration because the procedure to get high fuel pressure takes many steps like low pressure pump ? control valve ? high pressure pump ? common rail. 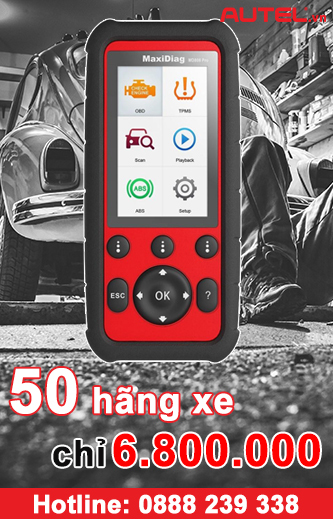 However, outlet control type has advantage of quick increase of fuel pressure but there are weak point such as loss of engine power and fuel temperatures up. Therefore, CRDi Euro-IV has been adopted “Dual Pressure Control type” so that precise and quick increase of fuel pressure can be easily established with various engine condition. Dual Pressure Control” type means that CRDi Euro-IV engine has the inlet pressure from high pressure pump and outlet pressure of common rail simultaneously. Fuel pressure gets high if fuel pressure control valve(P-PRV, Pump Pressure Regulating Valve) installed between low pressure pump and high pressure pump(inlet side) closes the fuel line with increased duty values controlled by ECM. With rail pressure control valve(PRV, Pressure Regulator Valve), the higher duty values from ECM the higher rail pressure is set because it closes outlet of common rail. ECM controls current for Both P-PRV installed on high pressure pump and PRV installed on common rail after sensing RPS installed on common rail so that CRDi engine gets optimum rail pressure control corresponding with current engine RPM and load condition. If the condition that is out of target rail pressure is occurred due to mechanical or electrical problem, ECM controls fuel amount to minimum limit to get limp home and set DTC. The relevant to this DTC is to indirectly diagnose mechanical operating condition of feed line of low pressure, high pressure pump, P-PRV and PRV etc. through out the current value of P-PRV, PRV and RPS output value. 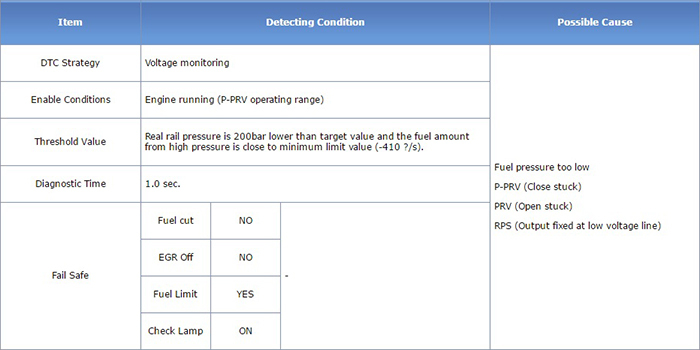 P1186 is set when rail pressure is 200bar lower than target value and the fuel amount from high pressure is close to minimum limit value (-410 ?/s) in condition that rail pressure is controlled by fuel metering unit (P-PRV). Check whether less amount of fuel is delivered than target amount of fuel controlled by ECM, too much return amount delivered to common rail or stuck resulting from low voltage of RPS.